Your husky will love any activity that stimulates his natural instincts. The Siberian husky is a large, athletic and energetic breed, originally bred to pull sleds for the Chukchi tribe of Siberia. He’s certainly a good fit if you live an active, outdoorsy lifestyle. This is a dog who thrives when allowed to indulge his instincts but who may misbehave if bored or not properly trained. Fortunately, you don’t need year-round snow to find a fulfilling activity to do together. Your Siberian husky loves to pull. It’s in his nature and is one of the reasons he’s such a great sled dog. This is not such a welcome habit when you’re walking through the neighbourhood on a leash. Use positive reinforcement to teach your husky that when he doesn’t pull, good things happen. Siberian huskies are not naturally inclined to obey and please their master, but you will need to harness some of that free-spiritedness to make your husky compatible with the domestic environment. Vary the training to keep your husky interested and avoid prolonged training sessions as they could lead to boredom. If you’re lucky enough to get snow where you live, take advantage of your husky’s love of the white stuff and go sledding, he’ll know exactly what to do when he feels the weight of those reigns against his shoulders. If you don’t get any snow, consider taking him on holiday to a place that does. Your husky will love the athletic and mental challenge of agility training. Enroll in your local class or teach him yourself if your yard is big enough. Start with some small jumps. When safe to do so, let your husky off his leash and run. This will help your pet burn off some of that energy before he gets back to the house. Make it more interesting by harnessing yourself to the dog and using your body weight as resistance for him. This is called canicross. Socialization from a young age is essential for any dog, but huskies are very pack oriented and absolutely thrive in the company of other dogs. Join your local class or just head down to the local dog park to meet some new faces. All you need is a specialized shoulder harness, a scooter, a helmet and access to some flat terrain. Just attach the harness to the scooter and mush! Scootering is an ideal alternative to sledding if you don’t have the right weather. Skijoring is a Norwegian word that translates as ski-driving. You need a specialized shoulder harness for Lucky, a belt for yourself to which you attach the harness, a pair of skis and lots of snow. Lucky will do all the work, you just need to remain upright. 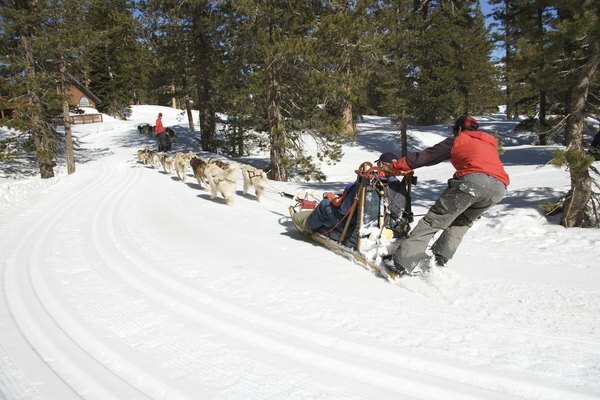 This is similar to skijoring but doesn’t require snow. Just replace the skis with rollerblades and you’re all set. If you’ve got a bike, all you need is the harness and a helmet and you’re good to go. You can let Lucky pull you along or you can share the work. Can House Cats Transmit Diseases to Humans by Digging in Dirt?